This is the first of many Notes from the Field. Dr. Rico and I visited a number of communities in the Ojuelos Municipality (like a county in the U.S.). We settled on three closely cluster communities: La Granja (The Farm), Los Morenitos, and Salitrillos. These villages are remotely situated in the Altos of Jalisco. 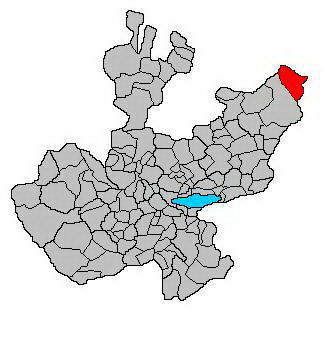 Altos are the foothills or mountains of the State of Jalisco, in the far northeastern part of the state. From Guadalajara, it was about a four to five hour drive. The last hour of the drive was slow going on bumpy roads. We left Guadalajara quite early in the morning in order to have enough time to do our Needs Assessment of the villages. The area used to employ many people in copper, gold and silver mines, but most of the mines have panned out. Most of the men have left for work in the U.S., while their wives take care of the families and try their hand at farming. They grow corn and beans and raise goats, pigs and chickens. The land is very rocky and arid, so productive farming is difficult here. Some of the pictures below give a good idea why it is so hard to farm. I will be posting more from this trip soon, so check back! Here is a little information about Ojuelos, Jalisco. ASU Magazine’s latest issue featured an article, “On Their Way to the Top: Young Alumni Showcase Talent, Promise“. The article highlighted Laura Libman as one of the talented alumni. 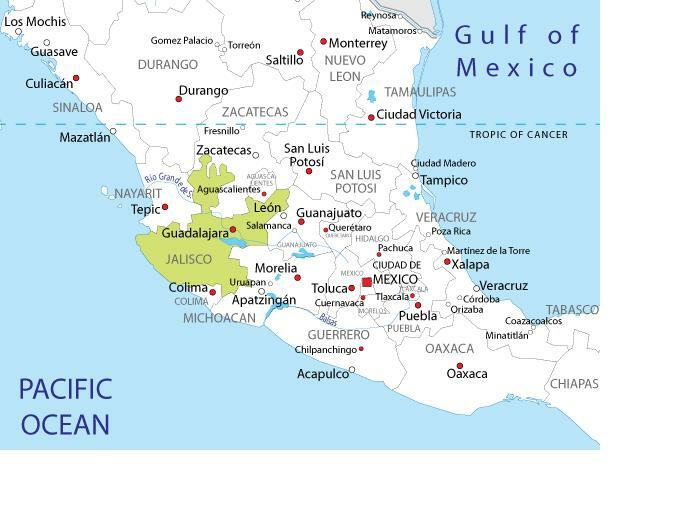 Here is a map of Jalisco and its location in Mexico. It will help you orient yourself on where our current projects are. 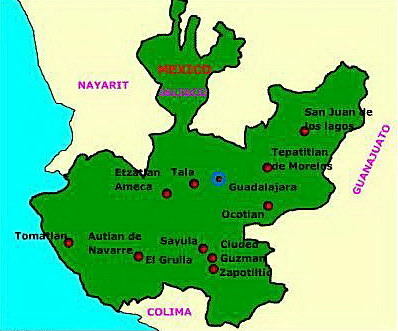 Our next set of communities will be near Ojuelos, Jalisco, the red area on the map. 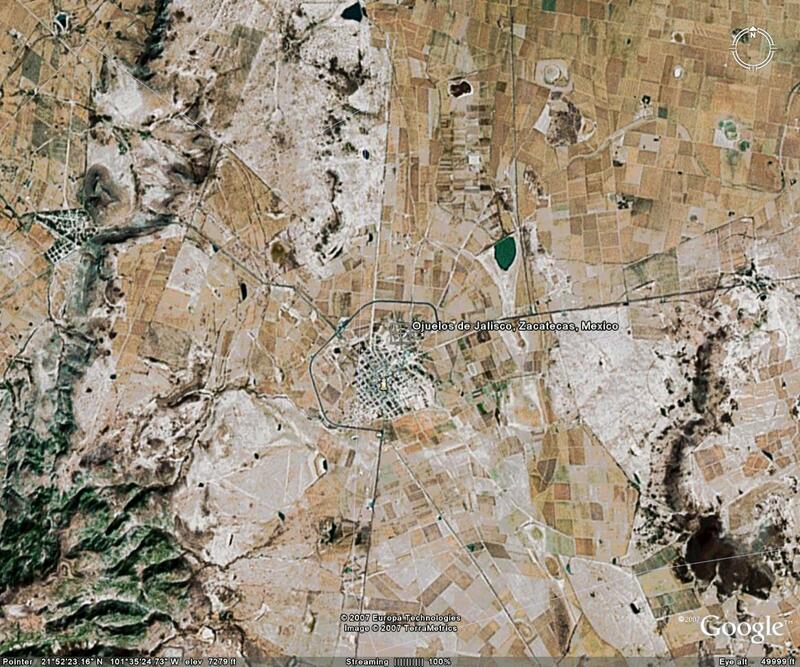 The Google Earth image below shows the town of Ojuelos. The next launch will be in the villages outside of the town, near the mountains. Our next project will be launched in the communities near Ojuelos, Jalisco. Laura will be visiting those communities on May 7th and 8th to conduct a needs assessment in the area. During her visit, she will hold village meetings to elect the new promotoras and visit with municipal officials to arrange for continuing resources. You can keep up on the progress by viewing her daily reports in our Notes from the Field section.